Some of you may have seen the frame designs I posted here. Decided to mockup the H-257 V5 frame before I had it cut out of any expensive materials. I used a plastic cutting board from Walmart to make the top frame plate and some Lexan to make the bottom plates. All were cut with a scrollsaw, jigsaw and drill press. Overal I think it turned out pretty good, I might make a few tweeks here and there, will know more once the motors and props arrive and I get her airborn !! 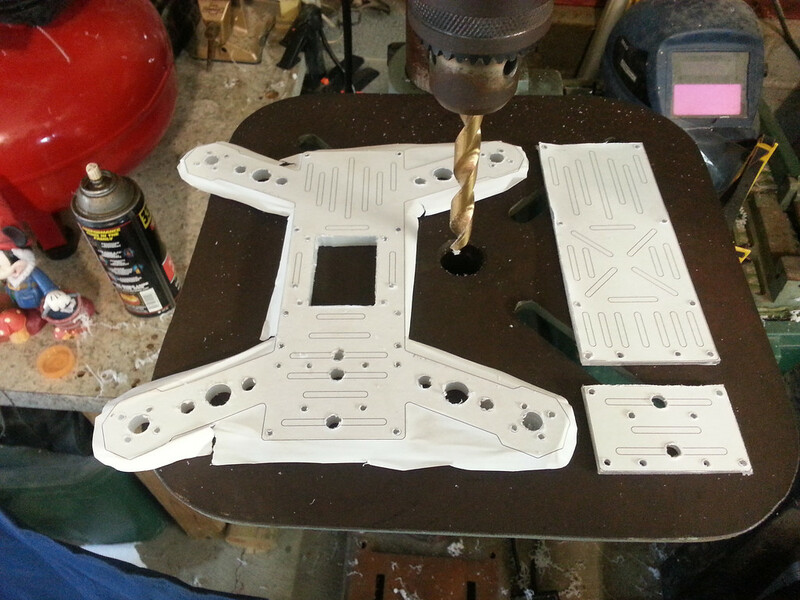 The main top plate of the frame was cut out of plastic. This is actually a cutting board that I bought at Walmart. Its very very easy to cut and work with, but is not the best material to use for this, since it is a bit heavy and has too much flex to it. But it worked well for mocking things up and testing. The bottom plates were cut out of Lexan. I designed the frame in CAD so I printed out the design in full scale and glued the paper printout to the plastic, this made it really easy to cut out. I used a scrollsaw and jigsaw to cut it out. 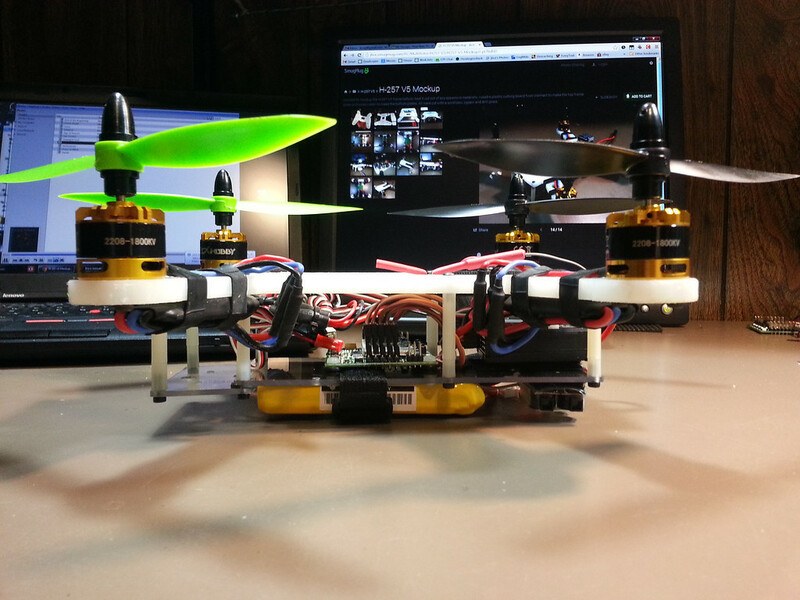 Got the RCX 1800kv motors from myrcmart last night, got them mounted and wired up. Left the bullet connectors on for now since this is just a mockup, will remove them and solder the wires once its final. 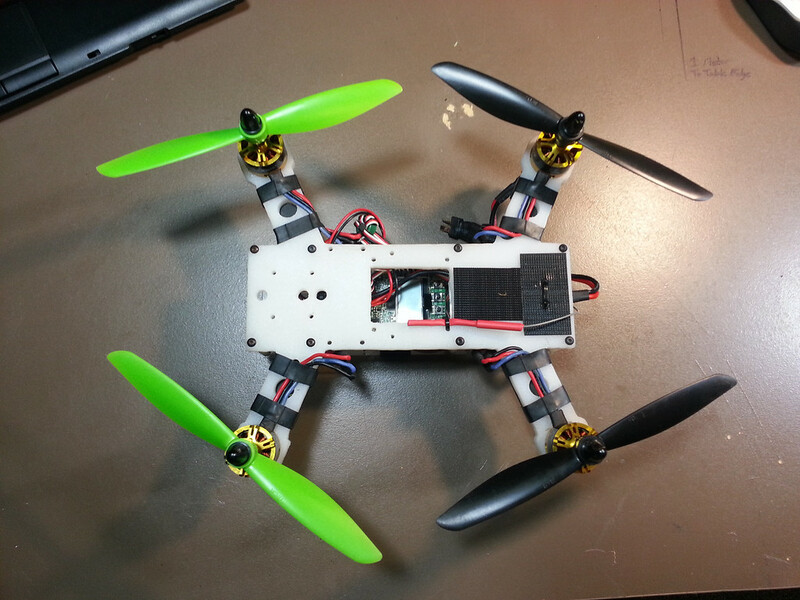 They seem well made, just waiting on batteries and props to arrive now and will give her a test flight! I can already see some things I want to change on this. For one, the bottom plates will be just one plate, with just the 30mm standoffs. 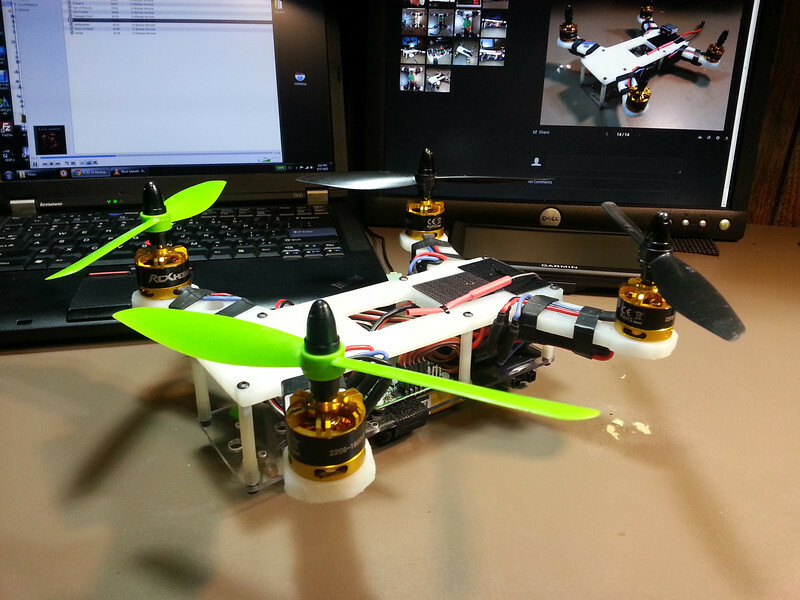 I will not be using a gopro on this quad, just adds too much weight and bulk. It can handle it just fine I am sure, but just no need in it, I have a 808 #16 camera on the way that I will use on it for recording video, and and FPV feed. Can always strap the gopro under it if I reeeeally want to. 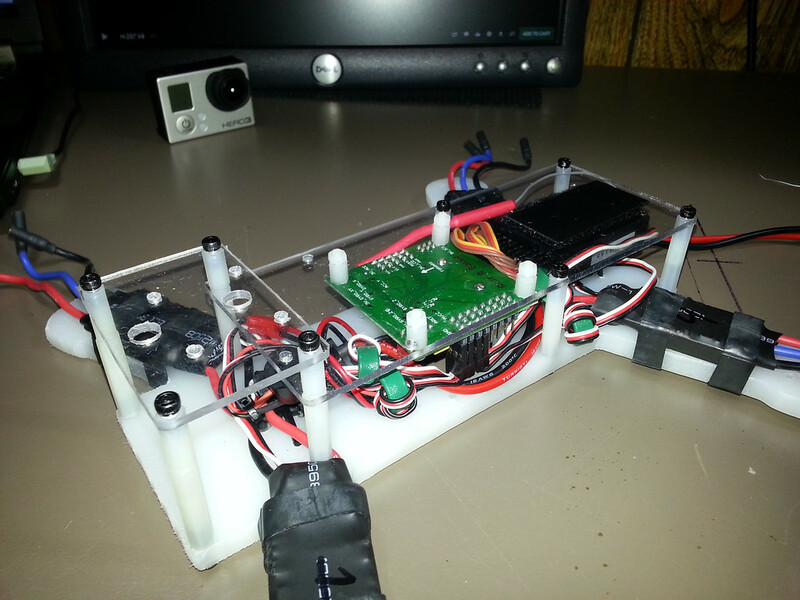 Oh also, a little tip, dont use zip ties to hold the ESCs on, (I know everyone does this) use “ranger bands” !!!! Its just a small 1″ dia bike innertube cut into peices to make rubber bands. 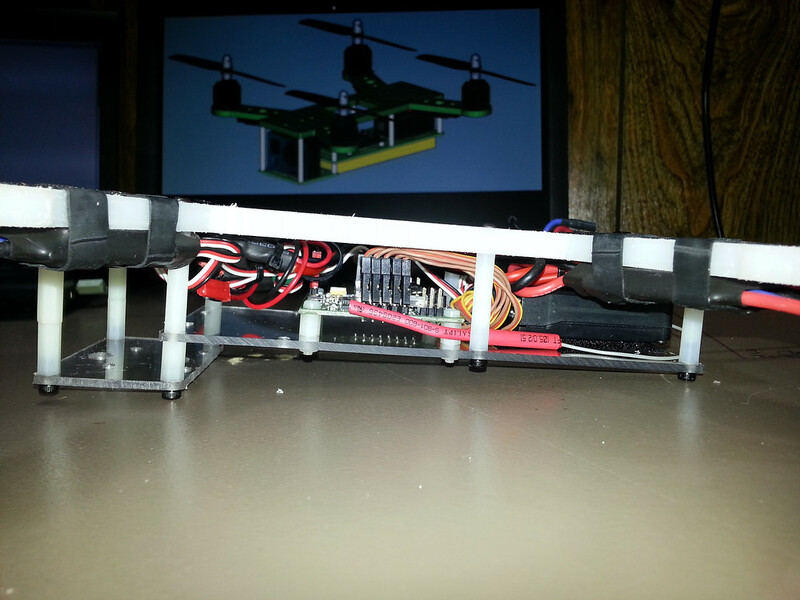 Holds the ESCs much better, you dont have the hard zip tie touching delicate electronics, and it wont slide around. I ultimately gave up on this frame for now, since I ended up buying an Armattan CNC 258 frame and using the parts on it. 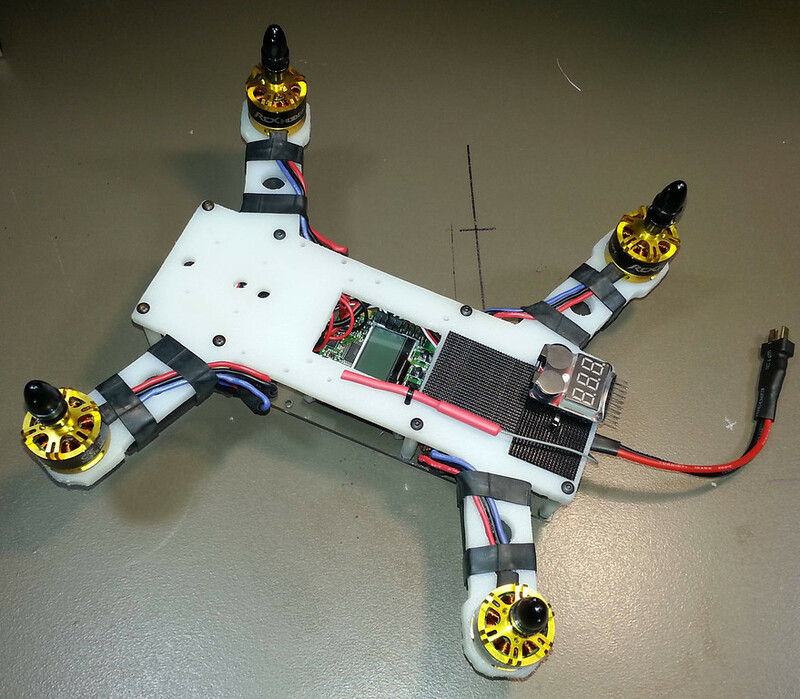 But I hope to get back to designing some frames and making more homemade quadcopters!